Designed for use with 1996/Later style switch housings & switches. Contoured shape provides a unique look. The wide blade style levers are easy on the hands due to their ergonomic shape. The extended top edge reduces hand fatigue. Mirror mounting holes are located far enough from the reservoir for custom mirrors with large stems. 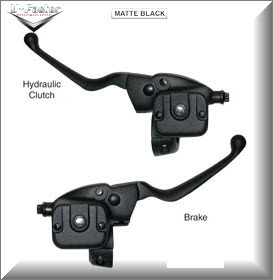 Manufactured by V-FACTOR Matte Black Hydraulic Clutch with 9/16" bore. Matte Black Brake with 5/8" bore.